I am a devoted tea-drinker. I had to be – I grew up in an Irish household. Tea is a thing in Ireland and the UK. Fanaticism over what constitutes a “proper cup o’ tea” has been debated ad nauseum on the internet. On Ravelry, there are 27 pages of teapot cozy patterns of various sizes, shapes, and colours to choose from. Its a tea-lovers dream! However, this post is not about tea. No, its about its rival cousin – coffee. Or more specifically, about Bodum (aka French Press) cozies. Apparently, they are not really that common. A google search will land you an Etsy shop or two selling them, or some odds-and-ends kitchenware stores that supply them. 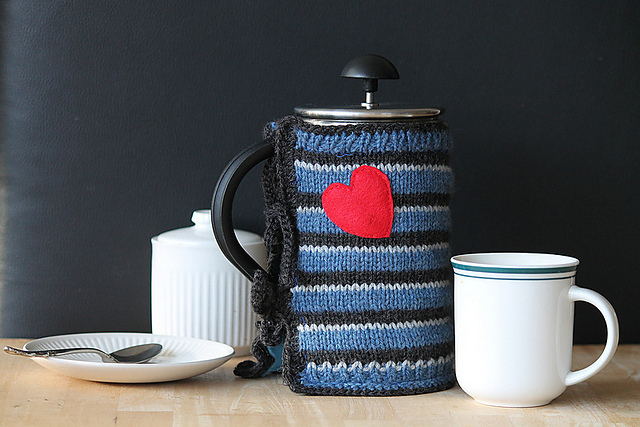 A Ravelry search shows only 1.5 pages of Bodum/French Press cozy patterns. What gives? My understanding is that coffee is the beverage of choice in North America, but its accoutrements are not afforded the same amount of consideration as tea’s do. Hmm. A very dear friend of mine is an avid coffee drinker – Bodum/French Press preferred. However, their coffee would continually get cold very quickly. They were using a much worn and stained tea towel wrapped around the Bodum to keep it warm. This technique was not very effective but was the best method available at the time. Until I decided that this lukewarm coffee tragedy must end. And so, I decided to knit a Bodum cozy. Bodum cozies can either cover the entire Bodum (similar to a teapot cozy) or can wrap around the Bodum, leaving the spout free so that you can enjoy your coffee while it retains its heat. I decided to go with the latter option and picked this pattern. As this pattern required very little yarn, I used only yarn ball ends to stashbust and create what I think its a pleasing cozy. 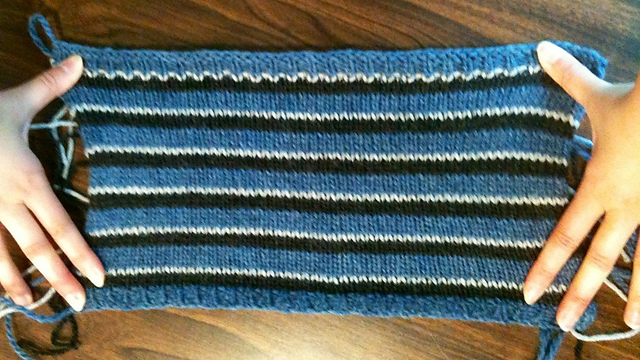 I knitted 4 rows of blue (Cascade Eco+ in steel blue), followed by 3 rows of charcoal grey (unknown yarn ends), and 1 row of light grey (Bernat Berella Solids) – rinsed and repeated until the cozy was about 13″ tall. I made the cozy a bit taller because I knew I would be lining it with craft felt to make it warmer, and this would cause the knit fabric to shrink in size a bit. Photo courtesy of Carsen Farmer. I think it looks great! My friend has reported back that their coffee is much warmer now, but thinks that double-felt would make this cozy even better. Definitely something I’m going to keep in mind if I make another. All told, there is about 165 yards out for stashdown on a 3.75mm needle. You are currently reading The trouble with coffee is… at When Gaia Smiles.